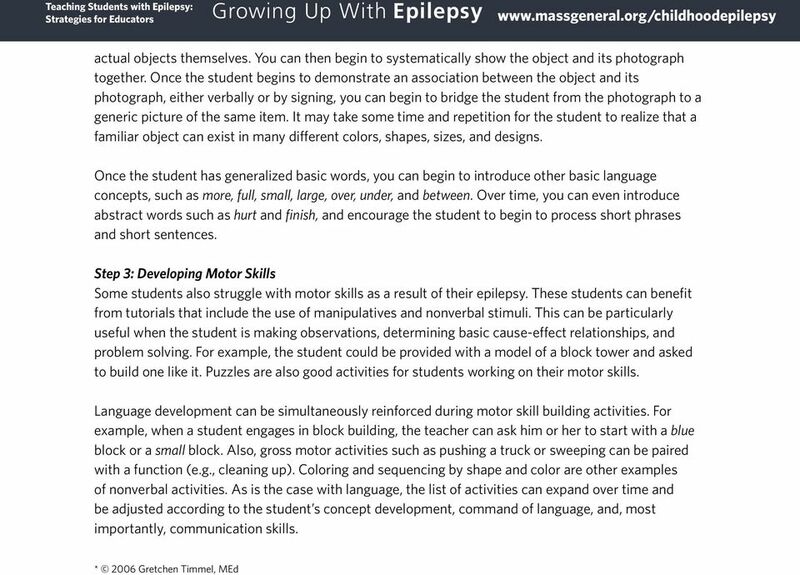 Download "Growing Up With Epilepsy"
3 Sample curriculum concept for a young child: Full The student learns what full means in different scenarios. At home, she is told that her cup is full of juice. Full is used during a song in class, with the teacher highlighting the term for the student. During his or her individual tutorial, the student practices putting beads into a cup until it is full; during speech and language therapy, the student might identify pictures that illustrate full. In addition to learning the meaning of the concept, the student also learns how to generalize. In other words, he or she understands that the same word full applies to many situations. Function theme The student s thematic lessons focus on the functions of objects in his or her world. For example, the student learns that a phone is for talking into and clothes are for wearing. His or her parents can reinforce these concepts during the family s usual morning and evening routines. In the classroom, the teacher can reinforce the idea of function during the rules of a game. ( You re the duck, so you need to sit. Or, You re the leader, so what do you do? ) During one-on-one tutorials or therapy, the student can use manipulatives to show an object s function, such as showing that a pencil is for writing. Teddy bear theme The student s teddy bear or doll can be used as a stand-in for the student to talk about his or her routine. During class or in a tutorial, the student can show what the teddy bear does from the moment it gets up brushes its teeth, uses the bathroom, gets dressed, etc. until the end of the day. At home, parents can ask the student what the teddy bear would do next while going through the routine, both to help the student become more adept at his or her own routine as well as to practice communication skills. In order to use the thematic teaching approach, it is important to have good communication between everyone on the student s team. This can include parents, doctors, and various specialists. 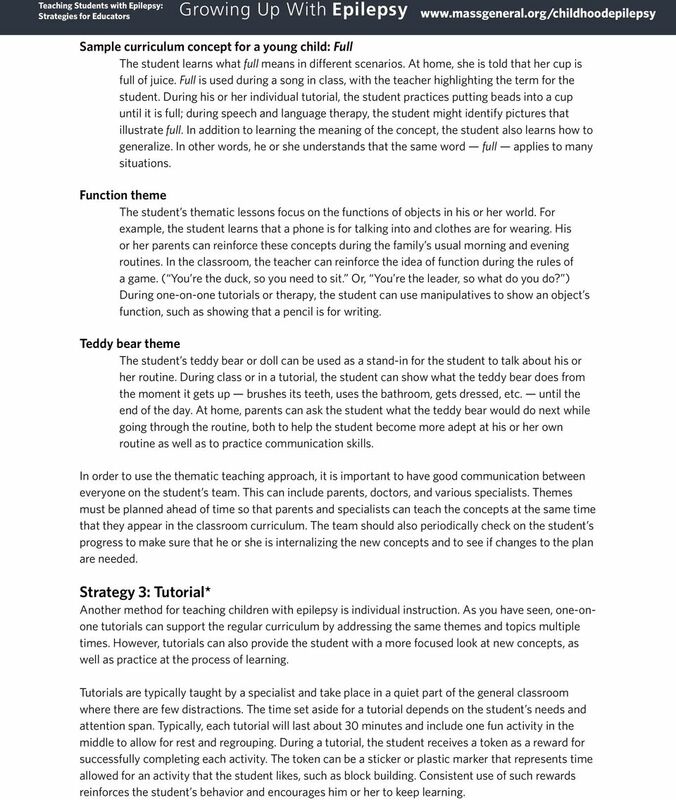 Themes must be planned ahead of time so that parents and specialists can teach the concepts at the same time that they appear in the classroom curriculum. The team should also periodically check on the student s progress to make sure that he or she is internalizing the new concepts and to see if changes to the plan are needed. 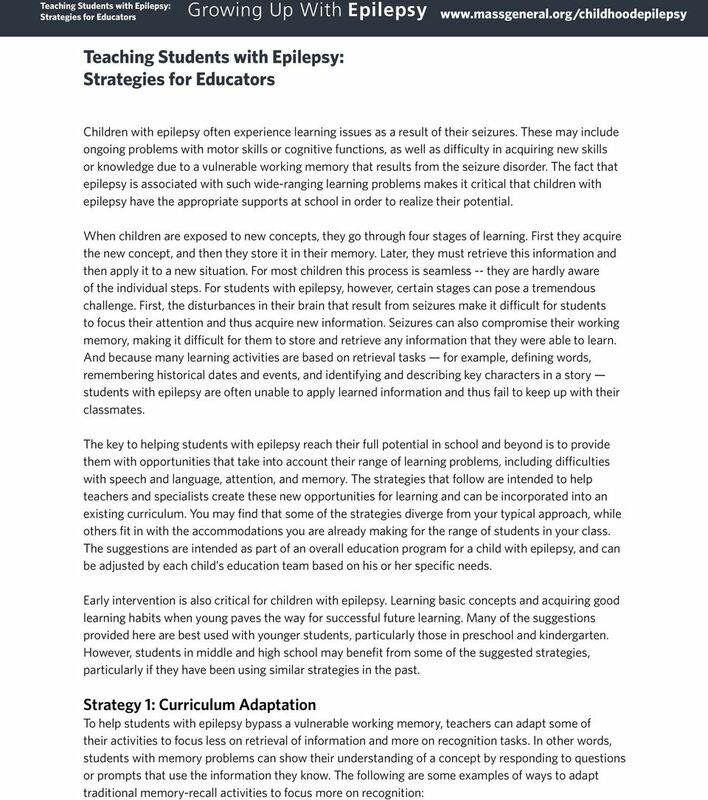 Strategy 3: Tutorial* Another method for teaching children with epilepsy is individual instruction. As you have seen, one-onone tutorials can support the regular curriculum by addressing the same themes and topics multiple times. However, tutorials can also provide the student with a more focused look at new concepts, as well as practice at the process of learning. Tutorials are typically taught by a specialist and take place in a quiet part of the general classroom where there are few distractions. The time set aside for a tutorial depends on the student s needs and attention span. Typically, each tutorial will last about 30 minutes and include one fun activity in the middle to allow for rest and regrouping. During a tutorial, the student receives a token as a reward for successfully completing each activity. The token can be a sticker or plastic marker that represents time allowed for an activity that the student likes, such as block building. Consistent use of such rewards reinforces the student s behavior and encourages him or her to keep learning. 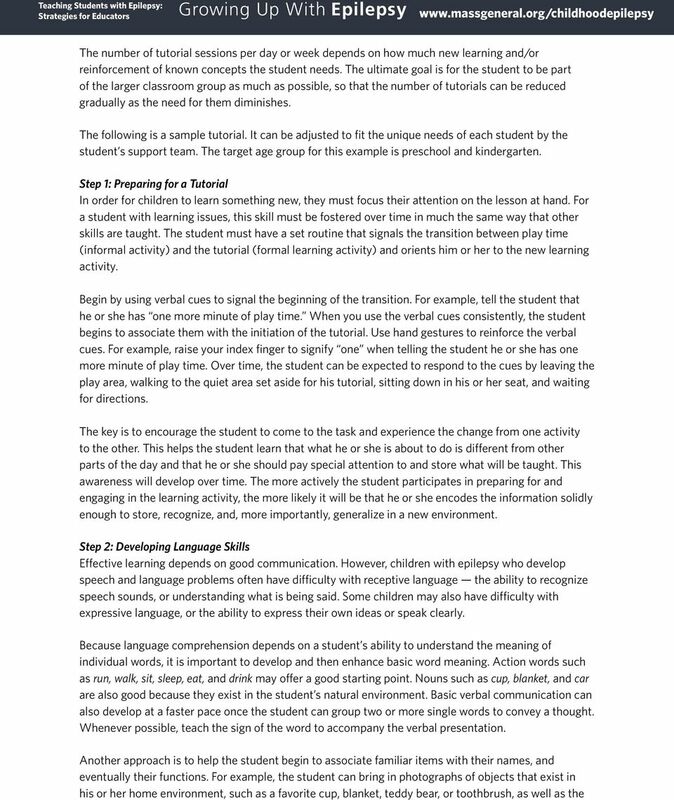 Instructional Practices Curriculum Differentiation Discrete Trial Overview Age Appropriate Materials Curriculum 61 Curriculum Portland Public Schools has adopted curriculum for Communication Behavior Classrooms. Simple things you can do to help your child grow, develop and learn. An introduction to the Minnesota Early Childhood Indicators of Progress. Preschool Development Assessment Child s Name: DOB: Completed by: Date began: This document may be copied for classroom use only. Not to be sold or used on any other website. Property of www.re-teach.com. Treasure the Silence! Using Non-Verbal Cues to Manage Behaviors Would you like to. Be able to deter negative behaviors without speaking a word? Be able to change behaviors without stopping your instruction? Explanation: Kindergarten students will solve addition and subtraction problems presented in a story format up to 10. Eleuteria Gonzales-Dobbe CCLM^2 Project Summer 2012 DRAFT DOCUMENT. 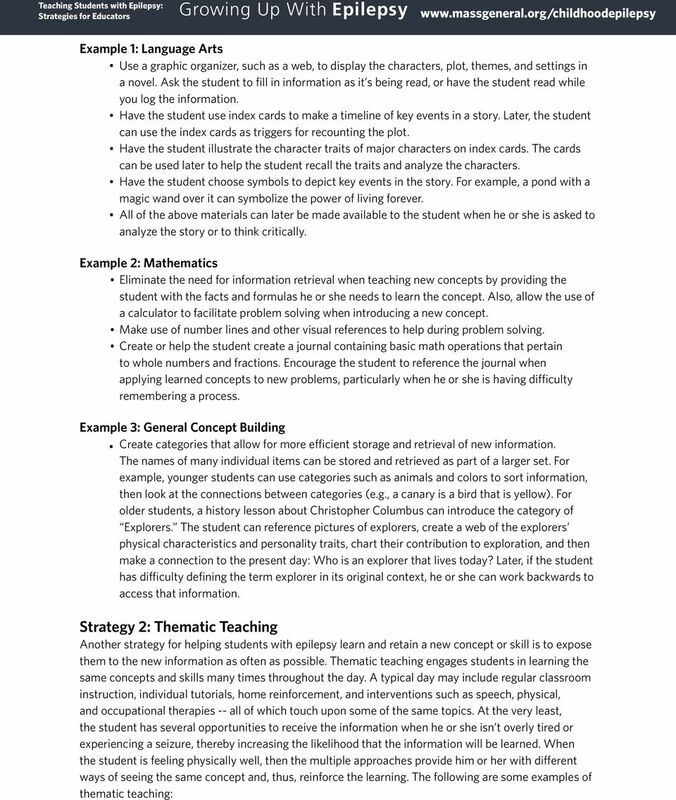 This material was developed as part of the Leadership for the Common Core in Mathematics (CCLM^2) project at the University of Wisconsin-Milwaukee. Visual Strategies for Students with Autism 4/4/12. Visual Strategies for Students with Autism Spectrum Disorders. Susan L. McCorkle. www.projectlearnet.org WHAT IS COGNITIVE INTERVENTION/REHABILITATION? Developing Comprehension and Expression at a One Key Word Level The child is currently developing their understanding of single words. They still rely heavily on non verbal cues from the speaker e.g. pointing. Examining the Structure of your ABA Program William Frea, Ph.D. & Ronit Molko, Ph.D.
Jesus Heals a Blind Man Bible Story John 9:1-11,35-38 Teacher Challenge Jesus felt compassion for all the people He met, and that compassion was shown in His dealing with the blind man in today s story. WHAT S IN OUR SHOPPING CART?